The crown jewel of lost but not completely forgotten hikes around Golden has to be the Howse Pass trail from the Columbia valley side, it has all the elements of an ‘epic’ adventure: hard to get to, hard to follow, and hard to find information about. In 1978, under the advice of the Historic Sites and Monuments Board of Canada the minister responsible designated the Howse Pass as one 7 mountain passes with national historic significance The last recorded maintenance to the trail was done in 1993 and currently holds ‘abandoned trail’ status according to some online sources. 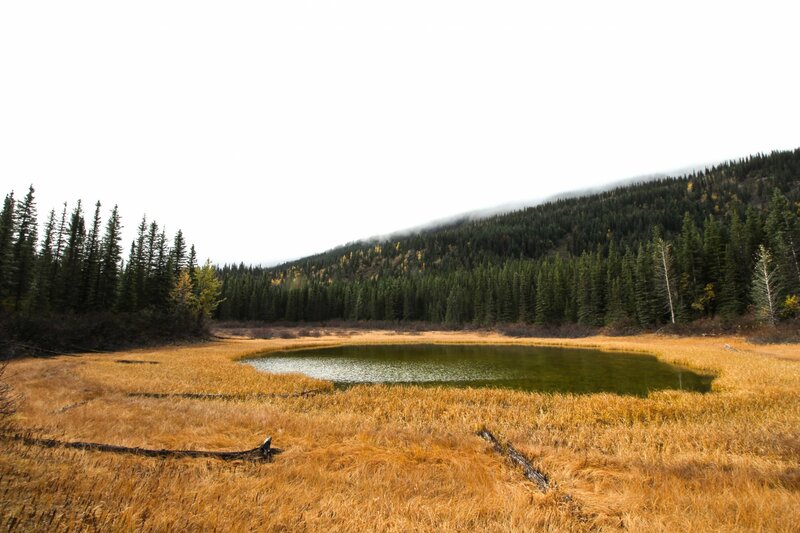 Historically, the trail was a used as early as the 18th century by the Ktunaxa to gain access to the Buffalo herds on the plains east of the Rockies, and was first explored as a trading route in 1807 by David Thompson and the North West Company. 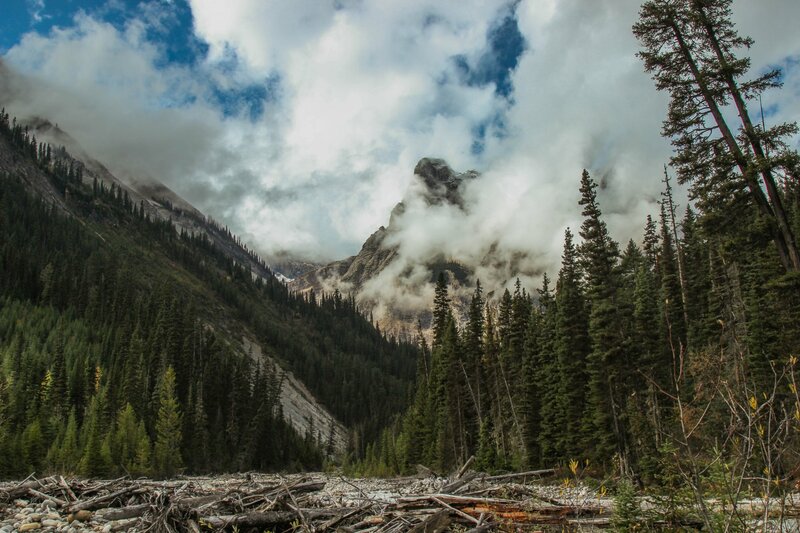 The trail was used as a trading route from Rocky Mountain House to the Columbia Valley until 1810, when the Athabasca Pass trail (currently the Icefields Parkway area) became the route of choice to avoid conflict with the hostile Pikani seeking to block trade with their rivals. Currently, the trail can be accessed from the Blaeberry River FSR; the road is washed out at 27.5km and is impassible by truck, but an atv trail has been cut just above the old road to get around the washouts. At km 26.5 or so, at the old Blaeberry townsite, there is a great spot to stage from, camp, and unload quads, bikes or side by sides. Passed the staging area, the trail is getting washed out in spots and caution must be exercised to avoid falling into the river. Once passed the washouts, travel is easy on the old road right up to the abandoned (but still usable) Cairnes Creek rec site. The trailhead isn’t marked but once you have crossed Cairnes Creek, the trail can be picked up easily for a few hundred meters and there are even a couple signs letting you know you are following David Thompson’s footsteps. The next km of the trail is pretty much gone but the route is easily navigated by following the river; a machete or a saw is highly recommended, and expect to encounter blowdowns and thick alders every 10 meters or so. Once you have made it past the first km the trail is easy peasy, a little over grown, but easy to follow for the next 12km all the way to the pass. About 2/3 of the way to the pass is an abandoned (but still usable)rec site where Ebon Creek empties into the Blaeberry; crossing Ebon creek is a bit sporty as the old aluminum bridge is out and beat up, some rock hopping and log balance beam skills will grant you access to the other side. Visible from the rec site is a very picturesque triple waterfall that pumps even in low water; definitely worth a stop to snap a few photos. Once on the other side of the creek you start the mellow climb up to the pass; fairly uneventful with the exception of a few small ponds and gullies. The pass is marked with a few signs and a metal stake signifying the BC/Alberta border as well as the Banff National Park boundary. If you have time, it is worth it to drop down the other side of the pass to the Howse river where it opens up to a wide valley revealing views of Mt. David and the headwaters of the North Saskatchewan River. The Howse pass is part of the continental divide and the Alberta side of the pass flows to the Atlantic and the BC side flows to the Pacific. Interesting! Although 98.5% of the Howse Pass trail is through valley bottom with not much to look at, I took solace in knowing that I was potentially walking the exact same route as traders more than 200 years ago and the Ktunaxa from the 18th century. There aren’t many other trails around Golden with the same historical significance so if you are looking for adventure and some nostalgia, this is the perfect route. 5 Things You NEED to Know about The Gondola to Gorman Hike. When someone tells you about a sweet waterfall in the Rocky Mountains, what comes to mind first? A fresh coat of forest service road dirt thickens on the dash of my truck as I bounce through the Blaeberry.